I’m Melanie McCarthy. I am currently a freshman majoring in strategic design and management at Parson’s School of Design. I’m from Philadelphia, but I love living in New York. My sister is graduating from NYU in a week and we’re going to live together next year. I love corgis and all kinds of music (except country) and I have found my identity in art making. Makeup is my preferred medium, although I’ve worked with countless mediums over this first year of college. Over the course of this year, I have shifted dramatically in my process. When you’re a kid, creativity comes naturally and unfiltered. You do whatever, you make whatever, and you say whatever. This pure spirit is filtered out through school, where you’re taught to think before you speak and not to say “dumb” things and where you are taught to fear. School teaches you to fear everything, especially to fear failure. School also teaches you that process doesn’t matter. That no matter how hard you work or no matter how much you learn, it’s all about that final grade. Anything below an A is not acceptable. Student do everything to get an A, for all the wrong reasons–because high numbers get you places. School also teaches you that what people think of you matters. You have to draw inside the lines, be this person that everyone else is. You have to be liked, or you’re lame. Parsons has helped undo these mistakes that my middle school and high school experiences have taught me. Parsons brought back my ability to not care what people think and just be me. Parsons taught me to try and fail and learn from failure and acknowledge it and appreciate it. Parsons taught me that nothing is “dumb,” that ideas you’re “supposed to” shoot down in your head could actually be valuable, and why not offer them. Parsons has opened my creative outlook and broadened my thinking, allowing me to be a better artist and be more myself. Before Parsons, I had a horrible work ethic, awful time management, and procrastinated everything. Since beginning at Parsons, I’ve become the organized, timely person I’ve always admired. I work hard on each task, plan out my time well so I can get everything done, and not stress too much when doing my work. I now jump into my work immediately and just let my creative mind take control instead of overthinking my project until I’ve wasted half of my time. I like to just begin and see what happens and if I mess up, then move on to another idea. There’s shame in trying and failing, so long as you’ve tried your best. In my Entrepreneurial Making class, my teacher emphasized not overthinking anything: to just begin and see where you end up. She was adamant with us not getting too caught up in the little details: if you question yourself so much, you will never get anything done. This was so challenging for me. I was always so good at overanalyzing everything and caring way too much about the fine details. That class made me realize that failure is ok and inevitable, and to just accept that so I can actually make products. The more you stress, the less you do. Just do it. Once I applied this to my work, I felt like I could breathe and let go and just fall into the creative abyss. I now apply this to every aspect of how I work. This is how I approach everything, whether it be studio making or academic studies: just begin and let your creativity flow. This also makes everything more exciting, because you’re in the game and not on the sidelines. Instead of stressing about all the work on your plate, you dive in and see where you go, which was really exciting for me. In thinking about when I could have done more research, making or writing, I could argue that you could always do more, and maybe that could’ve been helpful, but I did more projects a certain way, and they wouldn’t be like that if I did more. I like the closure of it all, the idea that those objects or projects exist as they do in time and maybe I could direct my next project forward with the knowledge I didn’t use before, but those projects are how they are and I wouldn’t change them. I’m going to highlight my two studio finals, since I am the most proud of these two projects. For my first studio final, we were tasked with research on an artist of our choosing, replication of one of their works, and creative a piece inspired by them. 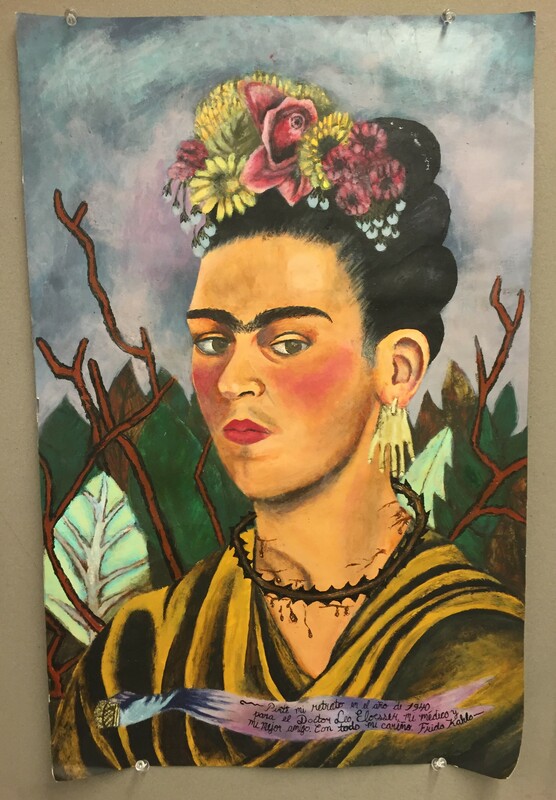 I chose Frida Kahlo, a champion for feminism. I researched her impact on the feminist art movement for seminar and researched her paintings for studio. To begin my recreation, I outlined the basic shapes of the painting I selected and printed out that outline on plotter paper and then traced that onto drawing paper. I then began the long process of painting. This took me upwards of 60 hours. I began with basic painting knowledge, but I was very unfamiliar with how to really paint. I learned a lot through this long process. The process felt like research for me: I was researching firsthand how she crafted her own portrait by doing it myself. I learned about colors and how to create them and shapes and shadows and highlights. It was enlightening. 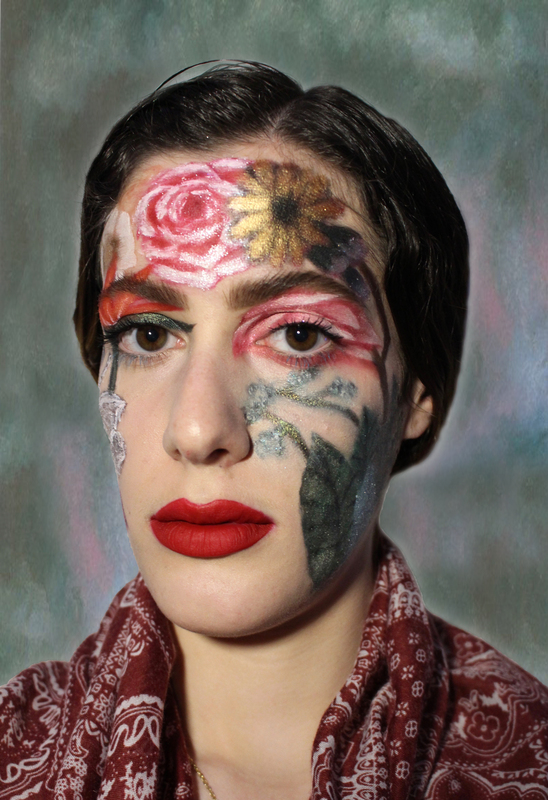 I then did a makeup look inspired by the use of foliage and florals in her pieces, which gave me insight as to how to make her style my own. I learned a lot about how I work and how patient I am. I learned about when detail is necessary and when I just need to get something out there. For my second studio final, I was required to make a garment inspired by a designer of our choosing. This was anther huge challenge for me, since I had dated sewing knowledge and absolutely no idea how to make a garment. I remember calling my mom after the first class, frantic that I would fail, that there was no way I could do it. My piece was inspired by the 2012 Fall Dior collection designed by Raf Simons. I was inspired by his use of a very feminine top paired with masculine suit pants and how that was such a definitive feminist look. The working woman: in a “man’s world” but proudly feminine. She expresses her gender loud and clear. I knew I wanted to recreate this idea, and to a sort of inverse of his design: masculine jacket on top, feminine dress below. I began with a sketch which led to some prototyping, seeing exactly what I wanted to do. I then got patterns, since I knew the work I had lined up for myself and had no idea where to begin. I created the jacket and dress in two full days of work, and then spent upwards of 30 hours sewing individual squares of fabric to the bottom of the skirt, working their way up, imitating the texture of flowers. Looking back, I wish I had more faith in myself beginning both these finals. I always underestimate my abilities and stress out over all that I need to get done, when I should just begin and stop complaining. These highlights in my year represent my persistence and effective work ethic. They were such monumental challenges for me, and they made me realize that I need to give myself more credit. My work is thorough and I am very proud of myself. I definitely want to pursue more about feminism and its intersectionality. I want to highlight expectations on women and how much harder we have to work to achieve success. I am open to many mediums and excited to try new ways of expressing myself, but I’ll always love doing makeup the most, so hopefully I can work that in to more projects in the future. I’m excited to take my lithography class next semester, a decision which was actually inspired by our visit to the MoMA and the piece we had to write for our bridge assignment this semester. I wrote about the rock and roll poster wall, in which the posters were mostly printed using lithography. I am so excited to learn this new medium, especially with all the inspiration of rock and roll posters lining the walls of my house in Philly. I’m just so ready to jump in to whatever comes my way and find passion in this incredible school that allows me to find my creative wings.